In a mood of frenzied trading on late Wednesday, Twitter shares rose by 73% closing at $44.90 from its initial debut price of $26.00. The enthusiasm that investors had for the 7 years old microblogging company despite posting a loss of nearly $70 million last quarter even exceeded expectations of analysts. 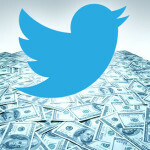 Although many binary options brokers are not offering Twitter as part of their asset index, a few leading brokers have decided to offer their clients the opportunity to trade in this exciting prospect. You van trade Twitter shares on 24option or Anyoption. promotional offer which actually amount to a free $/€ 50 sign up bonus for new traders. Of course the offer does not entitle traders to physically own the shares, but they can use the bonus to credit their trading account and trade in derivatives for Twitter shares. Those interested in taking up this offer should take note that the promotion is limited to ten thousand customers only. In addition to AvaTrade, other leading brokers like , IG and the social trading platform Etoro are also offering Twitter as part of their underlying asset trading portfolio. Without a doubt, traders who have decided to partake in the trading of Twitter shares will be in for a ride of their lives from all the volatility in the market generated by Twitter. With the success of Twitter’s IPO, it is likely that the market will be looking forward to other upcoming IPOs of tech companies like Airbnb, Pinterest, Square and Uber all which are valued at billions of dollars.